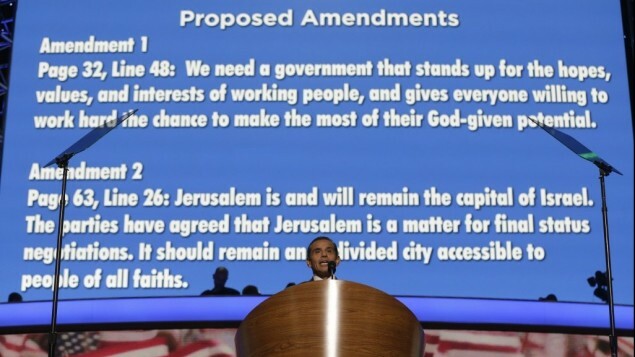 Well fancy that – US Democrats fall out over Jerusalem! A couple of intriguing items are currently running on World Watch Daily and which I’m copying below in view of rumours of undue influence from the Muslim Brotherhood’s US affiliates, eg. as on the occasion reported in this post. Dem. Party Heads Ram Through Pro-Israel and ‘God’ Language, Steam Roll Opposition — (video shows the chaos)!! convention delegates” – read analysis here. This entry was posted in Geopolitics, News, Politics, USA and tagged Jerusalem, Zechariah by Richard Barker. Bookmark the permalink. Could it be that the Spirit of God tipped the Democratic party’s hand and made them reveal the cards that they have been hiding all along? I do not for one moment think that the Republican party will escape the scrutiny of the Spirit, either. They use the Lord’s name quite often and would like people to believe that GOD is Spelled G-O-P. I think so Tony – there’s lots in these events. Interesting how my UK daily claims this instruction for change came POTUS (a ‘chameleon’, especially at election time)! As it’s our long weekend I may have more on this. PS. have also inserted link to older post in opening para of above posting.